This is the fifth article in a five-part series examining changes in Americans' health and well-being during Barack Obama's presidency. WASHINGTON, D.C. -- Americans' ratings of their standard of living have increased since President Barack Obama took office in 2009, with the Gallup Standard of Living Index rising steadily for the past 7 ½ years. When Obama entered the White House, the United States was in the midst of the Great Recession, which damaged the housing market, left many Americans out of work and caused the U.S. gross domestic product to plummet. 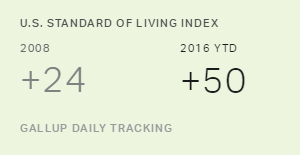 For 2009, the Gallup Standard of Living Index averaged +26, little better than the +24 found in 2008. It has edged up in most years since then, and for the first seven months of 2016, it averaged +50. Gallup's Standard of Living Index is a composite of Americans' responses to two questions: one asking U.S. adults whether they are satisfied or dissatisfied with their standard of living, and the other asking whether their standard of living is getting better or worse. The index has a theoretical maximum of 100 (if all respondents say they are satisfied with their standard of living and say it is getting better) and a theoretical minimum of -100 (if all respondents are dissatisfied with their standard of living and say it is getting worse). 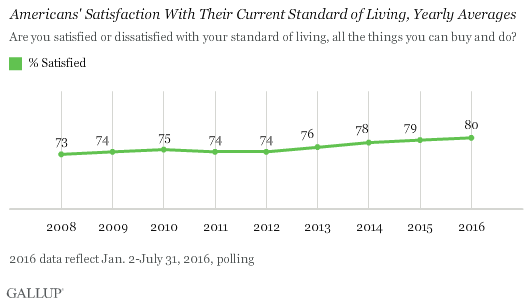 Americans have been largely satisfied with their current standard of living over the past eight years, even during the depths of the recession. At the beginning of the Obama presidency, 73% of Americans said they were satisfied with their current standard of living. By 2015, that figure had risen to 79%, and it is 80% so far in 2016. 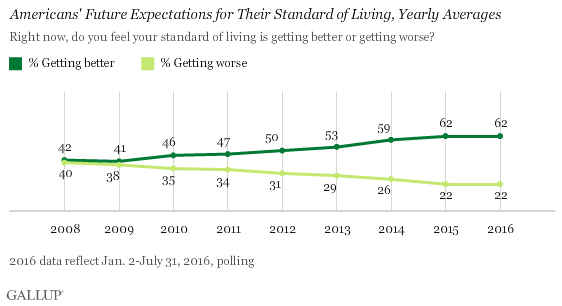 Americans' expectations for their standard of living going forward have changed more significantly over the past eight years than their assessments of their current standard of living. 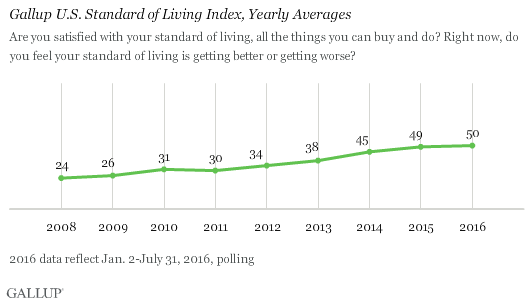 In 2009, 42% of Americans said their standard of living was getting better, while nearly the same percentage, 40%, said it was getting worse. The percentage saying their standard of living is getting better has climbed steadily for the past 7 ½ years, amid battles over the federal budget and sequestration. In 2012, the percentage rose to 50%, and more recently, it moved into the 60% range. This range has held constant thus far in 2016. Americans' evaluations of their standard of living have improved significantly across all income groups during the Obama era. The improvement is similar across all groups, even though those with lower incomes have lower Standard of Living Index scores than those with higher incomes. Non-Hispanic black Americans have reported the highest gains in the Standard of Living Index during the Obama years, with a 34-point jump between 2008 and 2016 to date. Hispanics are next with a jump of 31 points, and registered the highest index score among ethnic groups and races, at 62 in 2016. Non-Hispanic white Americans have an index of 47 in 2016 so far, a jump of 22 points from their 25 index in 2008. Standard of living is a chief component of a person's financial well-being. 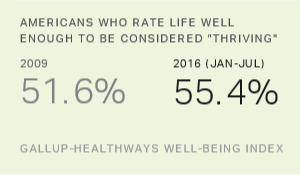 Though Americans' views of the U.S. economy are now more negative than positive after having been slightly positive for part of 2014 and 2015, their assessments of their personal standard of living have always been positive and have improved during Obama's presidency. The increase in perceived standard of living over the past seven-plus years reflects in large part the low starting point when Obama took office during the aftermath of a crippling recession. Since 2009, Americans' belief that their standard of living is getting better has increased steadily, as has been the case with other economic indicators such as job creation, and this is true across all income groups. Financial well-being is about more than just income. It also reflects Americans' ability to manage their money to reduce financial stress. Those with lower incomes who manage their finances effectively could weather storms caused by a global recession. Yet even if there is another recession, it is possible that Gallup's Standard of Living Index will not dip considerably, especially the percentage who are satisfied with their current standard of living. Results are based on telephone interviews conducted Jan. 2-Dec. 30, 2008-2015, and Jan. 2-July 31, 2016, as part of the Gallup U.S. Daily survey, with a random sample of adults aged 18 and older, living in all 50 U.S. states and the District of Columbia. The national sample size averaged 350,000 in 2008-2012, approximately 175,000 in 2013-2015 and about 105,000 for the first seven months of 2016. In each year since 2013, Gallup has interviewed about 130,000 whites, 16,000 blacks, 16,000 Hispanics and 4,000 Asians. The margin of sampling error for each reported racial/ethnic group is no more than ±1 percentage point in most cases, but climbs to 1.6 percentage points for Asians in 2016. All reported margins of sampling error include computed design effects for weighting.